I don’t think GNS3 supports any IOS images that support this, maybe IOU does. I tried this example on a CSR1000v router so that’s also a good option. GNS3 is supporting it features with 7200 model Version 15.2(4)S3. Please help me understand why you say everything is done globally. First, from global config mode, you have to go into named mode configuration; then you go into address-family mode; then, for each address family, you go into af-interface mode, topology base mode or whatever other mode there is. Frankly speaking, I wouldn’t care much for EIGRP Named Mode configuration if it wasn’t for the fact that you have to if you want to pass Cisco’s exam. With the classic version of EIGRP, some commands were configured globally and others were done on the interface. For example, advertising networks is done globally under the EIGRP process and authentication or summarization is done on the interface level. With named mode, everything is done in global mode under the router process but sometimes you have to jump to a “sub” section like the af-interface level. Rene - it seems like there is a lot that is done under topology base. Can you expand on that? Could you please talk in deep about address-family and service-family? IN EIGRP NAME MODE , DO WE NEED TO BE SAME NAME in all of router within autonomous system. When using EIGRP in name mode, you must use the same name for each instance of EIGRP that is running. This is done in the same way that you would configure a single Autonomous System number for each instance of EIGRP. If you are running multiple instances, then you would use multiple names. The main differences between named and classic modes are the way in which they are implemented (globally for named while both globally and in interface mode for classic) as well as the addition of a sixth K value for the metric. On the back end, that is, concerning the way that the routers interpret and operate in EIGRP, very little has changed. So a named mode EIGRP router can communicate with a classic EIGRP router. Since you configure the AS number under the EIGRP name configuration, if the AS is the same, they will communicate. Now the only restriction is the issue with the K values. In order for EIGRP named and classic to interoperate, the number of K values must be the same. There are two possibilities. One is that the classic EIGRP is being run on an older version of IOS which supports 5 K values. Named EIGRP configured router that receives EIGRP packets with 5 K values will revert to functioning with 5 K values and will not advertise the sixth. The other possibility is that classic EIGRP is configured on a newer IOS version will actually advertise a sixth K value, but will not have it participate in the metric calculation. This is why you may see a K6 value in a wireshark capture of an EIGRP exchange. This will allow classic EIGRP to successfully interface with a named EIGRP configured router, without actually using that 6th K value for the metric. I tested EIGRP named mode in GNS3 with both Dynamips and IOSv. It seems in named mode metric calculation varies from the classic mode. Even the metric calculation in the topology table is not the one in the routing table. Does anyone know the reason please? Thank you. The new 64 bit metric calculations are designed to be backward compatible with classic EIGRP. However, sometimes scaling can be an issue. More on this can be found below. Could you give me some explanation where i can set a topology that is not the topology base ? The topology must be defined globally with the global-address-family command in global address-family configuration mode before the topology can be configured under the EIGRP process. So, and sorry about that, that takes me to a new question: in my example, how to activate the interfaces of the topology VIDEO for EIGRP ? The example provided from the link I sent you that you attempted is found in the Cisco IOS IP Routing: EIGRP Command Reference document. This is a general overview document providing commands that are common to multiple platforms and IOS versions. Because various IOS versions may deal with commands differently, there is always the possibility that some differences may appear in such documents. Viewing documents that are more specific to the topics in question, we can get a more accurate view of the commands and how they function. This is the case for this situation. 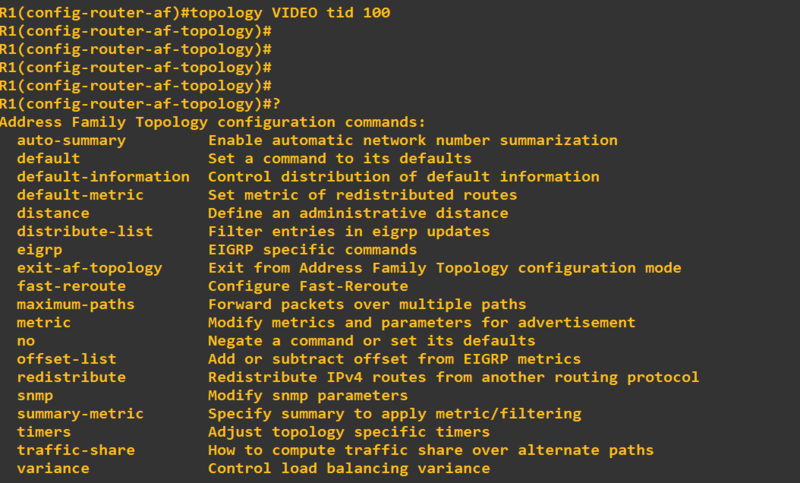 If you look at the following link from Cisco’s “Multitopology Routing Configuration Guide, Cisco IOS Release 15S” document, you will find that the commands are slightly different. Try experimenting with these variations in the commands and I believe that you will find the solution that matches your IOS version.